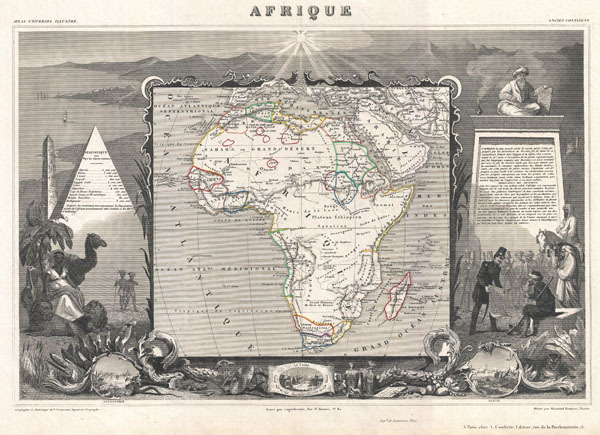 A fine example of V. Levasseur's desirable decorative map of Africa, dated 1852. Shows the entire continent according to perceptions of the time. Much of the interior is vague and unmapped, with the exception of the northern Nile Valley, the French colonies in Senegal, Gambia, and Algeria, and the colonies of the Dutch and English in South Africa. Offers a semi-accurate mapping of the Niger, which is uncommon for the period. Correctly identifies Lake Chad. The whole is surrounded by elaborate decorative engravings designed to illustrate both the natural beauty and trade richness of the land. These include the Pyramids, an seated Imam, the Luxor Obelisk, and views of Cairo, Alexandria, and Algiers. There is a short textual history of the regions depicted on both the left and right sides of the map. Published by V. Levasseur in the 1852 edition of his Atlas National de la France Illustree. Levassuer, V., Atlas National Illustre des 86 Departements et des Possessions de La France Divise par Arrondissements, Cantons et Communea avec La Trace de Toutes Les Routes, Chemins,de fer et Canaux., 1852 edition. Very good. Blank on verso. Wide clean margins.